We wandered to another part of the park where parents laid out their child’s ‘resume’ hoping for a marriage connection/partner. A woman yelled at me when I tried to take a picture. Seems it’s bad luck to be photographed. I understood it puts a pox on the intended. I laid low and managed a non-intrusive video on my iPad mini but I cannot upload it. However, I copied a frame from the video. Note the sheets on the ground. Stories abound about established career women. A female with a good job may be willing to stand in as breadwinners if even a younger male would co-operate. After all, her clock is ticking, but without a job of his own, he’ll shy away. 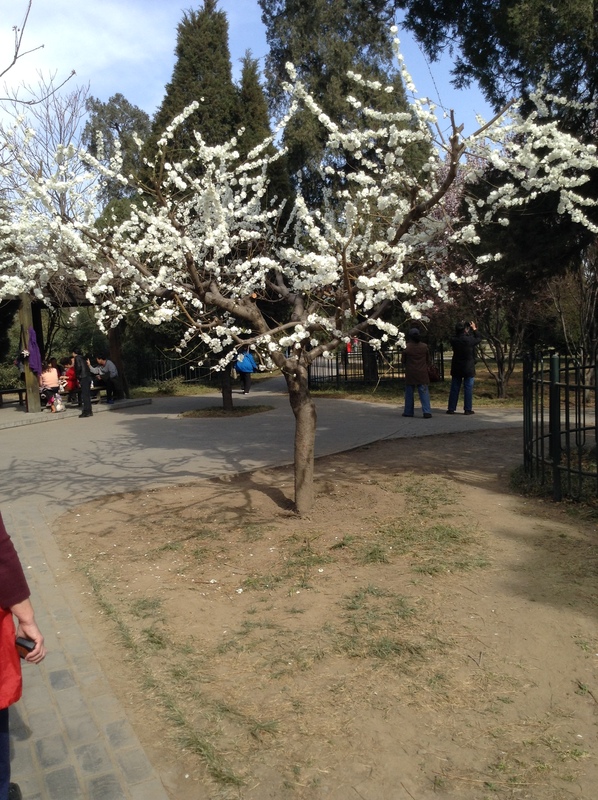 Categories: Beijing, China, family, holidays, travel | Permalink. An announcement reminded foot passengers to leave the ferry first when we docked because the ferry could not dock at the exact entry due to high tide (global warming). Then vehicle passengers were announced. A city bus awaited within walking distance to transport passengers to their jobs or other destinations. Instead of a streetcar, subway, train or their own car, people actually traveled this way every day. What a way to get to work and back. I wouldn’t want to do it every day. Mary took the elevator since we were on the second floor. Jean and I raced down the stairs and waited for the elevator door to open. A couple girls pushed the button on the deck level. Nothing. Did this mean the elevator was stuck? We waited and waited. Michael scooted to the first level looking for her. The vehicles hadn’t begun moving off yet so we had a little time. It turns out Mary hadn’t been clear which level to get off. We had a good laugh, but the important thing was we were in the van and ready to move when our turn came to exit the ferry. No time for sightseeing. We did last minute grocery shopping in Nanaimo before stopping in Chemainus for ice cream on our way to Penelakut Island and our second ferry to Thetis Island, our destination. We waited about 20 minutes—not a long line—hoping we’d make the cut and not have to wait for another one. This time the ferry was smaller and open. The deck wasn’t full even behind us. We’d started out at 6:10 a.m. and finally arrived at our lodgings for a late lunch. A long day already. I had no concept how large Thetis was but it didn’t feel like an island. We passed a fenced off Bible School and a cattle farm. The houses painted in lilac, green, and butter yellow had neat and pretty yards. Around bends and curves, we wound, the muddy gravel road neither straight nor boring. Michael, Jean’s husband, entered Overberry Resort first to register our arrival at the office and pic up a key. This is the entrance. The building is divided into thirds. Our side offered three bedrooms, a kitchen and a bath (our lodgings). The entrance way and foyer were in the middle, and the owners lived in the last third. We had a quick lunch of assorted cheeses, crackers, pate and squash soup Jean had brought from home. Scrumptious. Afterwards, a nap seemed in order, but Jean realized the late hour and called out she and Michael had to go to the Community Center to setup for the meet-and-greet later in the evening. Whoever was available would come from the Center to pick us up for dinner. By 5:00 p.m. it was pitch black outside, but I spied a hydro pole as the light came on at the top of the driveway. Here are older Images for overbury Resort. Much reconstruction and renovations have occurred to present day. Categories: birthday, come fly with me, family, Happy New Year, holidays, lifestyle, Thetis Island, travel, vacation | Permalink. Last December, sister Mary and I flew to Vancouver for sister Jean’s 60th birthday. The direct flight took four hours and forty minutes. The snack and refreshment cart rattled down the narrow isle after the first class passengers had been served—just three or four rows behind the cockpit ending the seat before us. No curtain of separation divided first class and the rest of the passengers. We ordered coffee. I received mine first and made a face. Mary noticed and tugged on the airline steward’s sleeve to change her order to mint tea. Of course, we thought him serious and therefore rude, until he grinned and giggled, laughter reaching his eyes. He was a rosy-cheeked, round fellow, with a belly which hung over his belt. The tousled-hair blonde female flight attendant was a larger woman than hired in years gone by. How refreshing life is becoming more realistic these days. I cannot believe I passed up a free, like-new book left on a brown refuse box inside the airport. My fingers itched for the thick Nora Roberts hardcover novel, but I was already weighed down enough. After experiencing the Camino-like trek through Toronto airport, we loved Vancouver’s. The baggage claim located close to ground transportation, Jean and her husband met us as soon as Mary texted our arrival. The first rain clouds in a month hung mean and leaden, keen to greet us. This was to be a family get-together with no time for sightseeing. Jean served a lovely snack at the house and later a late supper. The time to catch up turned to night. Weary from travel and excitement of seeing family again, we fell into bed midnight Vancouver time (9:00 p.m. in Ontario). The next morning, Mary and I slept in as Jean slipped out to a Yoga class and Michael dawdled in the kitchen assembling breakfast. A day of eating, drinking, and talking till we were hoarse (necessitating more drinking) followed. After supper, Michael prepared a cauldron of chili (maybe it was a large pot). I threw together a filling for Jean’s petit choux (like one-bite cream puffs): artichokes, softened sun-dried tomatoes, cream cheese, and feta into a food processor for a coarse blend. These were in preparation for the festivities New Year’s Eve. A day of accomplishing little, we finally called it a night around 11:30 p.m. I tossed and turned, bolting upright at a thunderous crack. I reacted by checking the shelves of books around us in the great room were intact. For a split second, I thought they’d exploded around us. The report sounded once and no more. My heart hammered on. Mary said it must be the wind. The household was awake at 6:10 a.m.—ten minutes later than planned—to catch the ferry to Nanaimo. Seniors get a discount but only if they are residents. Michael paid for the tickets. No one mentioned half of us were from Ontario. The early morning proved knuckle bleeding and foot stomping cold. We ran across and down the road to use the facilities due to our early arrival. Hurry up and wait, but that’s the unwritten rule. If you want to get on, arrive as close to the front of the line as you can before space runs out on board for your car. The mountains striking and the water calm, we enjoyed breakfast on board at around $10.00 each for eggs, home fries, toast, and choice of ham, sausages, or bacon. Our crossing across the Georgia Straits on the Coastal Renaissance transpired without incidence. Categories: birthday, car, come fly with me, family, flight, food, Happy New Year, holidays, plane, travel, vacation | Tags: Vancouver | Permalink.